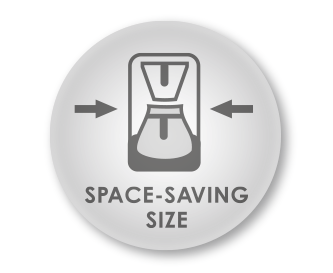 The Aromaboy® is a classic in the Melitta® portfolio. Small in size but makes great coffee – and that since 1979. A small and unique filter coffee machine, perfectly suited to single person households, caravans or holiday homes. Thanks to its compact size, this 2 cup appliance fits in every kitchen and is also ideal for use in a caravan or holiday home. With its new design the Aromaboy® is very convenient and a real eye catcher. The Aromaboy’s filter holder and glass pot can be simply and conveniently cleaned in the dishwasher after use. Tips and information about your CAFFEO® Discover the range of Melitta® ground coffees! Melitta® Coffee Filters. Available in three different versions, the way you like it: mild, classic or strong.